For the first half of the year Free to Air viewers were languishing without many new dramas series aside from those on ABC. For weeks -even months- commercial networks relied on Home and Away and Neighbours to keep their drama quotas going. Now it appears three new dramas are set to battle one another on Wednesday nights. Nine has confirmed Doctor Doctor to premiere at 8:30pm Wednesday September 14 -up against TEN’s Offspring season final. Update: TEN has confirmed The Wrong Girl will take up the Offspring slot on Wednesday September 28 following The Bachelorette. Now SBS has confirmed its only 2016 drama Deep Water (pictured) will premiere at 8:30pm Wednesday October 5th. Part 2 airs the next night against The Code finale. The 4 part contemporary drama from Blackfella Films is inspired by Sydney’s gay hate crimes of the 1980s / 90s. 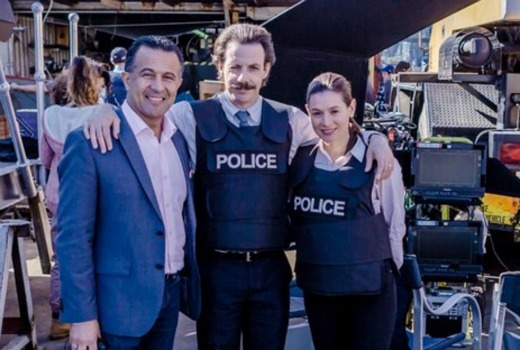 The cast features Yael Stone, Noah Taylor, William McInnes, Danielle Cormack, Jeremy Lindsay Taylor, Simon Burke, Ben Oxenbould and Dan Spielman. Dates for The Secret Daughter, Brock and Hyde & Seek are yet to be confirmed. I’m sure I heard a Nine promo on radio this morning that said Doctor Doctor starts 7.30 Wednesday September 14. I thought they may have had a change of heart and moved it earlier to avoid clashes? The promos for Doctor Doctor look great. Seems like its a clever script. Poor or one dimensional “join the dots” scripts are the curse of Aussie drama! Sadly the ABC now commissions series that should have never gone to air. Eg. Series 2 of The Code. Sadly I agree, but they do have Dr Blake and Miss Fisher to their credit. Tired,formulaic murder mysteries? Yeh, the ABC should be proud. I thought Actors Equity (or whatever it is called now) came to an agreement with the TV stations not to program Australian dramas against each other. It’s rare enough that the TV stations take a punt with a new local drama but to have them programmed against each other smacks of the infamous “genre matching” two years ago which caused two Australian reality series to fail and another being mortally wounded. Equity (and MEAA) have no say in scheduling. Might be getting wires crossed, sorry. Not all Australian drama is necessarily good, the ABC have had a few stinkers on this year so far. I’m all for employing our local actors and production people, but please, come up with some better scripts. Couldn’t agree more, that way nobody loses rather than everybody loses. Maybe the TV networks should stop their competing against each other for the sake of the crews and actors employed in the industry. The Nine network can have Monday nights with House Husbands , Seven can have Tuesday with 800 Words and Winners and Losers, Ten has Wednesday with Offspring and ABC has Thursday with The Code and The Tunnel. This practice of pitting local drama against each other is only hurting the industry, and alienating viewers. Stop talking sense. That has no place in Australian TV. Sorry about talking sense. I thought that some network heads did have some sense but apparently I was wrong.